Every cocktail that is offered in the Fragrances Bar is based on a popular perfume. 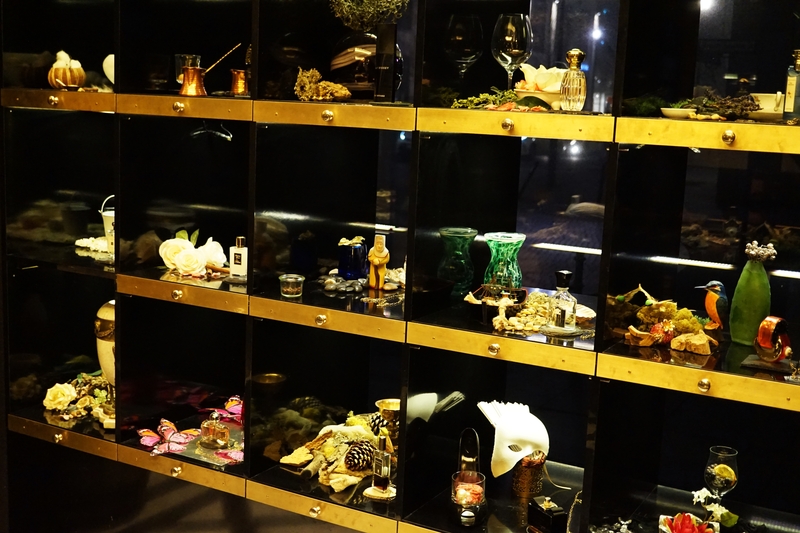 As you walk into the bar, display cases on your right and left hand side offer a range of niche and premium fragrances. Each installation (there really isn’t any other word to describe the presentation of the key ingredients!) 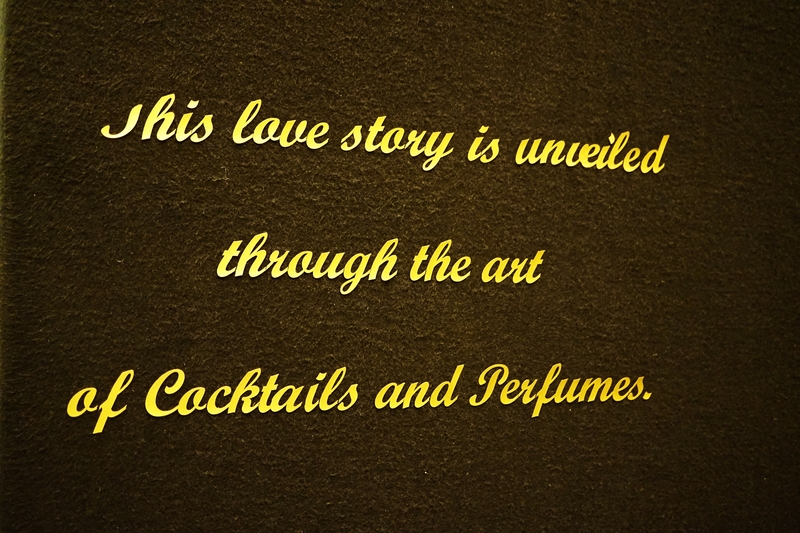 presents the perfume flacon that the cocktail is based on, a brief description of the scent and a bottle of whichever key spirit (rum, whiskey, eau de vie, gin, tequila) is featured in the cocktail. 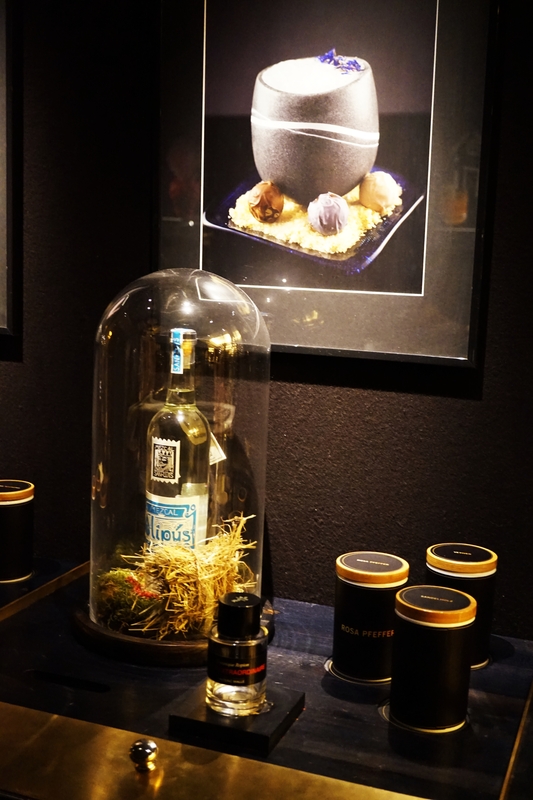 The main fragrance notes/ingredients are presented in black scent containers to offer olfactory tasting notes. 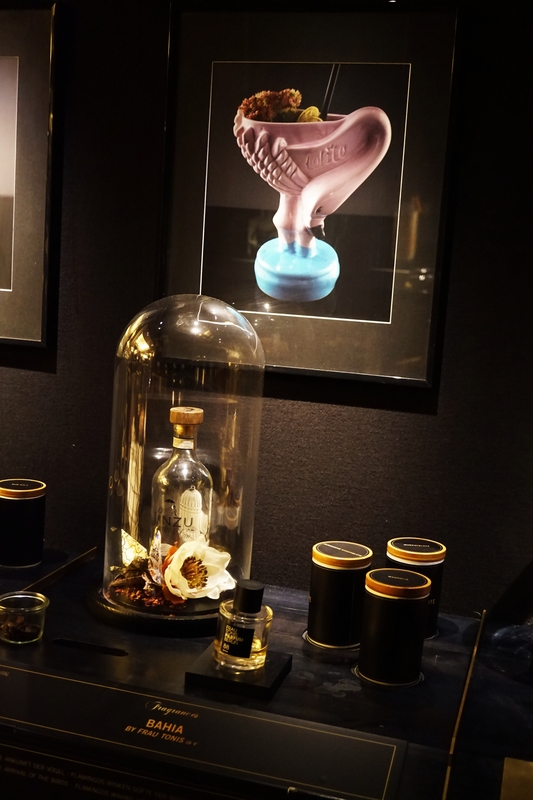 And the photo above the perfume display shows what the finished cocktail looks like. You can sample each fragrance; look at the key ingredients and then select whichever scent appeals to you. An olfactory cocktail menu! 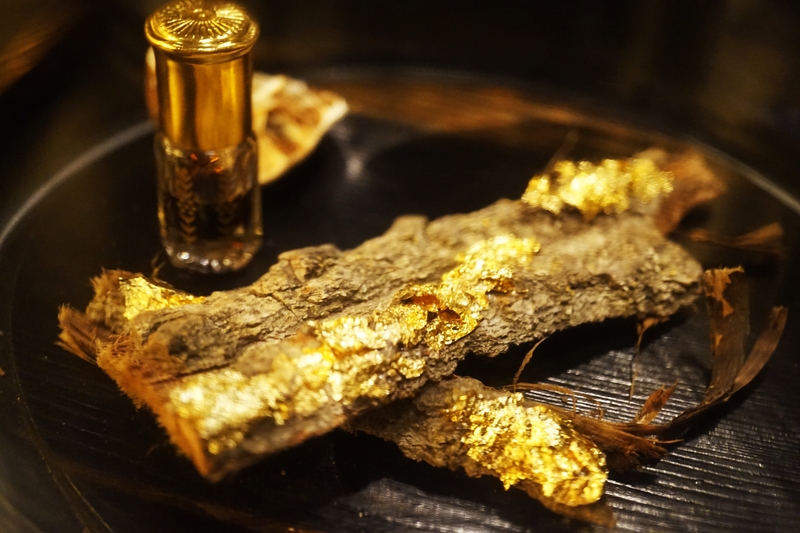 The fragrance in the picture below, for example, is Bahia from Berlin-based artisan perfumer Frau Toni’s Parfum. Bahia is an oriental fragrance, with notes of white magnolia and sweet almond blossom rounded off by aromatic cinnamon and nutmeg. Under the glass cover you can see the key spirit that is used to transpose the opulence of Bahia into a flavour interpretation: Jinzu is a Japanese-inspired gin made with sake distillate. 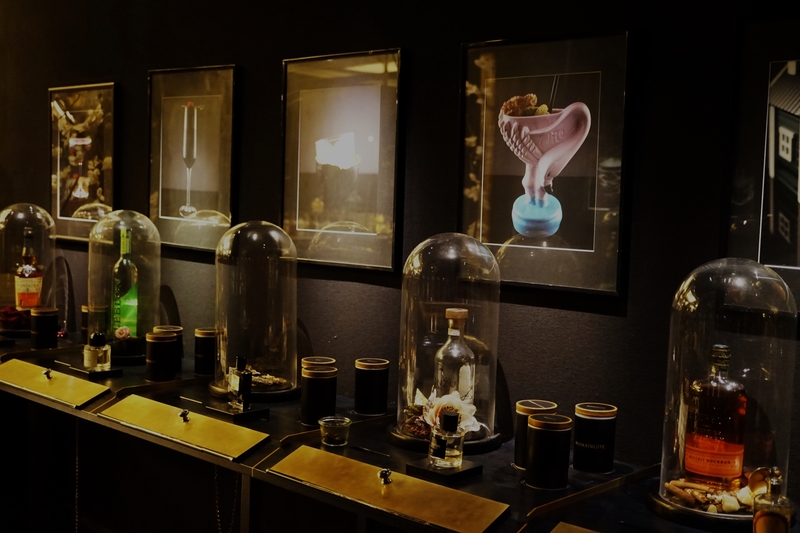 The black scent containers show three of the cocktail’s main flavour accords: magnolia, nutmeg flower and Japanese cherry blossom. And the display above shows Vetiver Extraordinaire from Frederic Mallé, an oriental men’s fragrance based on sandalwood, cedar, oakmoss and myrrh, with a heart of vetiver, pink pepper and cloves and top notes of bergamot and bitter orange. In its flavour interpretation, Vetiver Extraordinaire features a concoction of smoky Mezcal Melipús San André, Cointreau and bergamot, vetiver and sandalwood infused syrup which is shaken up with egg white and decorated with a light dusting of freshly grated cinnamon. 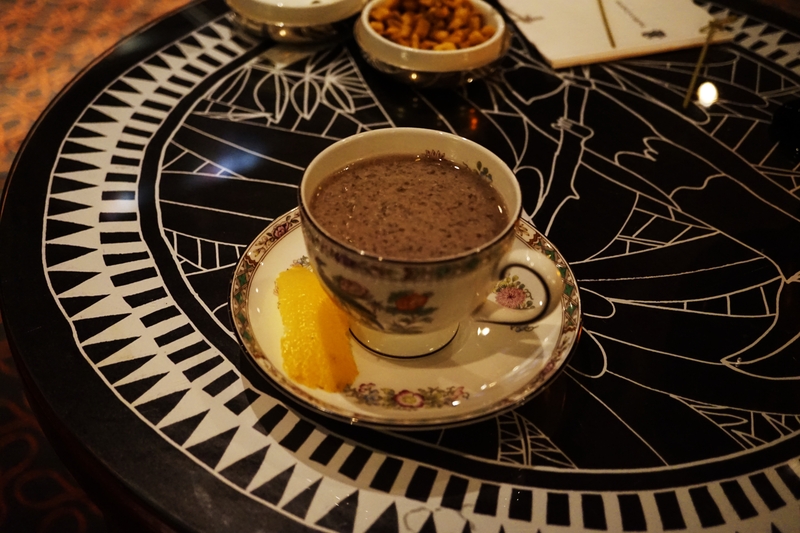 The drink is served in a light grey stone cup. So good. In total, the Fragrances Bar offers 30 fragrance cocktails (in case you’re wondering: their bestseller is “Mandarin Basilic” from Guerlain); a wall at the far end of the bar features another showcase with further fragrances. Each creation is served in a different vessel – note that I don’t say “glass”! – because traditional clear glassware is actually somewhat underrepresented in the Fragrances Bar. Cocktails are served in ceramic containers, tinted or etched glasses, stone bowls, metal cups, glazed pottery…my two cocktails came in a China tea cup and a chunky metallic goblet respectively. Anyway, back to the Fragrances Bar. 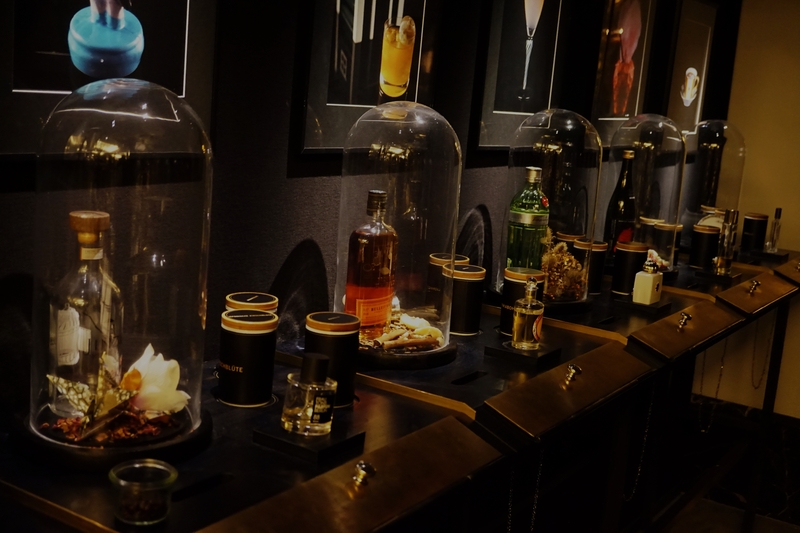 I made my selection from the display case at the other end of the bar (see above) – you can see the fragrance shelf from the street outside, by the way, it looks stunning. My first choice was Bulgari’s Eau Parfumée au Thé Bleu (launched in 2015). 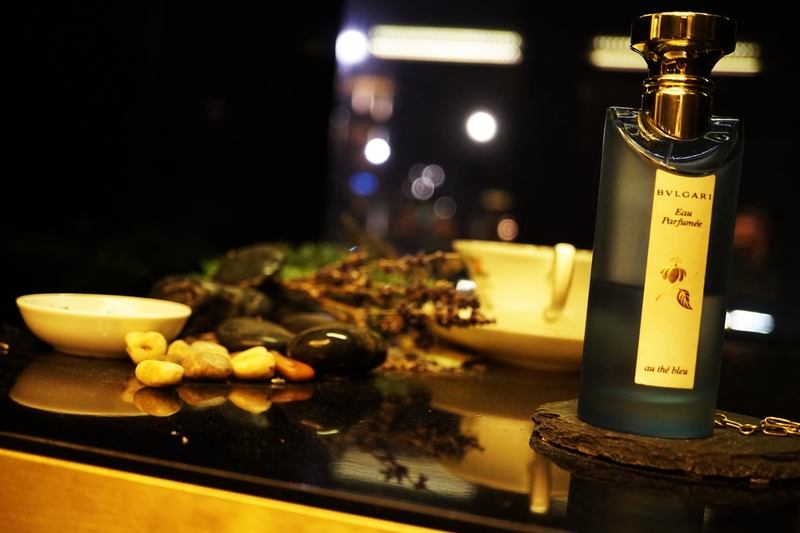 This fragrance is built around accords of oolong tea and blue tea, with top notes of lavender and shiso leaf (also called perilla) and a base of iris and musk. And above you can see how this fresh, green floral was transposed into an explosion of flavours: Oolong-infused Tanqueray gin, Japanese shiso shochu Tantakatan, home-made lavender syrup, violet liqueur and fresh lime. Served in a dainty flower-painted tea cup with a lemon zest on the side! 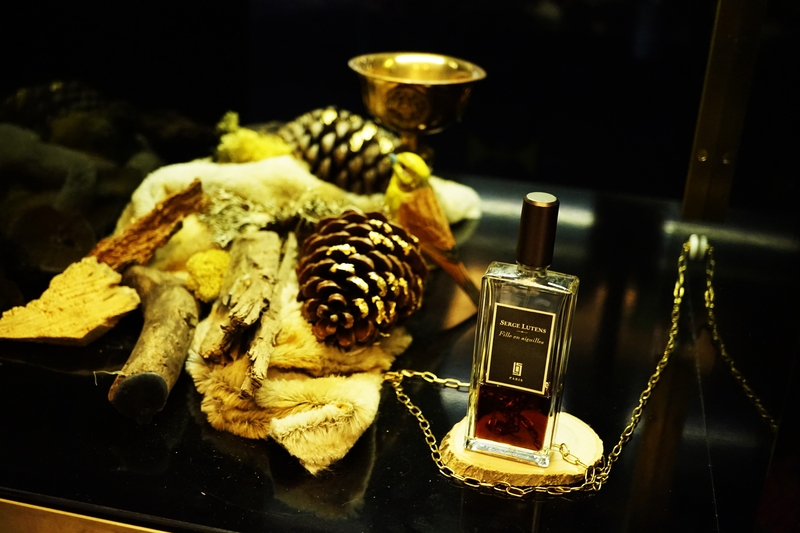 My second choice was Serge Lutens’ Fille en Aiguilles (launched in 2009) – a woody, aromatic, balsamic fragrance which combines notes of pine needles, fir balsam and bay leaf with francincense, candied fruit and vetiver. And below is the flavour recreation: Andalusian Lime Eau de Vie from German distillery Stählemühle, reposado tequila infused with a frankincense-scented tea blend from Mariage Frères, home-made pine and vetiver syrup and Giffard’s black raspberry liqueur Muroise au baie rouges. 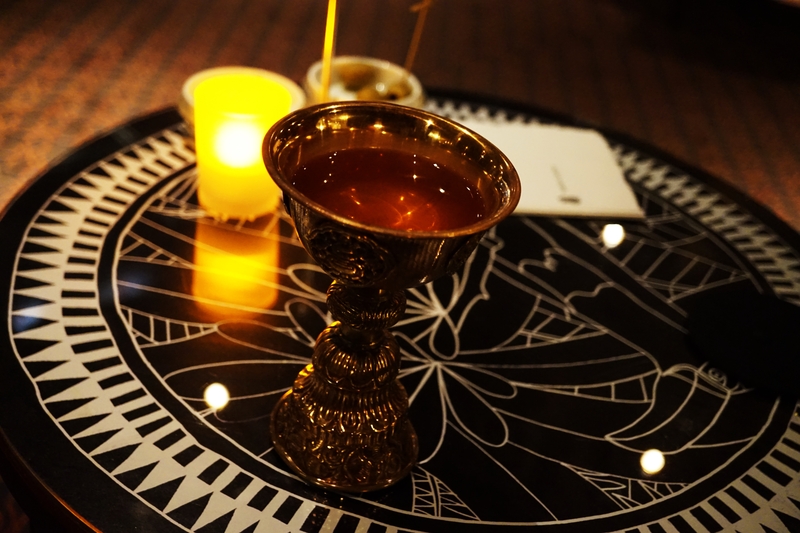 Served in a metal goblet. Heissen is one of the most innovative bartenders in Germany. The man’s a flavour genius (I’ve been a fan of his experimental cocktail creations for years) and well-known for his hand-crafted macerations, infusions, syrups, bitters and blends. Last December, Heissen introduced Botanical Fusions, an 8-sku range of flavour extracts that can be used to infuse sugar syrups or spirits. 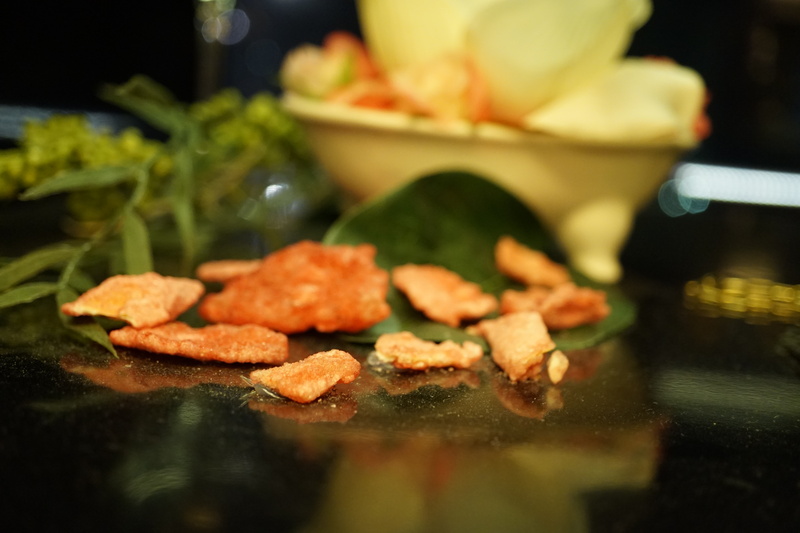 The line-up offers jasmine, sandalwood, bergamot, vetiver, cedarwood, pine, patchouli and mandarine. A visit to the Fragrances Bar is highly recommened. 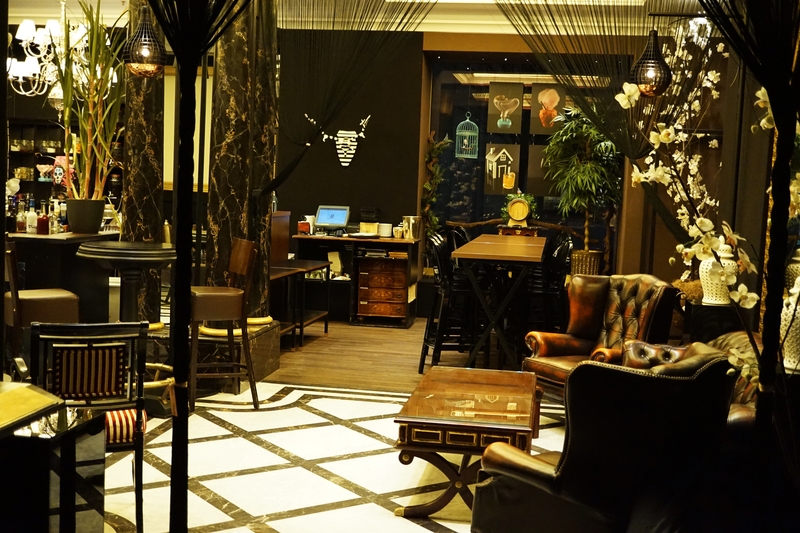 The Curtain Club is open every day, the Fragrances Bar has varying opening hours – they are usually open at the weekends and in summer time also on Wednesdays and Thursdays.